The Church of England's second most senior bishop has resigned and will return to being a parish priest. 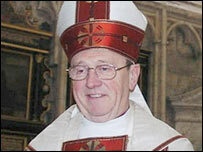 Dr David Hope, who has been Archbishop of York for nine years, will be invested in a more junior role by one of his own bishops in March 2005. The archbishop will swap his palace in York and a £60,000 salary for the rectory at St Margaret's, in Ilkley near Bradford, and just £18,500-a-year. But Dr Hope insisted he won't miss any of the luxuries of a bishop's life. He told BBC News he felt it was time to move on. He said: "It has been something that has been rumbling around in my mind and heart for a couple of years. "I will have done nearly 20 years as a bishop. It is the sort of time that you ought to be moving on." During his time as archbishop Dr Hope has aligned himself with traditionalists in the Anglican church. He has opposed the ordination of women and has warned that the internet could limit human interactions. He said St Margaret's in Ilkley, a town of around 5,500 people, was attractive to him because of the "traditional values" of its people. "Clearly I sympathise with their background. I'm looking forward to it. It is clearly a change and a challenge," he said. "I thought it would be good to conclude my ministry where I began - as a parish priest," he added. Archbishop of Canterbury Dr Rowan Williams described Dr Hope as "unfailingly effective" and "one of God's great gifts to the church". Dr Williams said: "In every post he has filled he has brought to bear a deep common sense, a complete unpompous attitude, a ready sympathy for all and an irrepressible dead-pan humour. "I shall miss him more than I can easily say, as a colleague whose wise advice and constant support have made a huge difference to my own ministry." 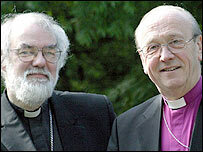 He added: "Everyone in the Church of England will want to wish him all good things in the next stage of his ministry." BBC correspondent Jane Little said Dr Hope has made no secret of his desire to return to what he has called the "real ministry" of parish practice. She said: "Dr Hope, as an opponent of women priests, has had the support of traditionalists within the church and some have seen him as a counterweight to the more liberal Archbishop of Canterbury. "His departure could not come at a more sensitive time for the embattled church." Dr Hope, 64, can continue as a parish priest until the age of 70.